I've just released the first release candidate for rules 1.0. Read more at groups.drupal.org! Read more about Rules 1.0-rc1 is out! Flag module 6.x-1.0 shipping with rules integration! Finally the flag module got released - a really useful module and known as the successor of the previous "Views bookmarks" module. The project page says: Flag is a flexible flagging system that is completely customizable by the administrator. Using this module, the site administrator can provide any number of flags for nodes, comments, or users. Some possibilities include bookmarks, marking important, friends, or flag as offensive. With extensive views integration, you can create custom lists of popular content or keep tabs on important content. But even better the 1.0 (and 1.1) release is shipping with extensive rules integration. 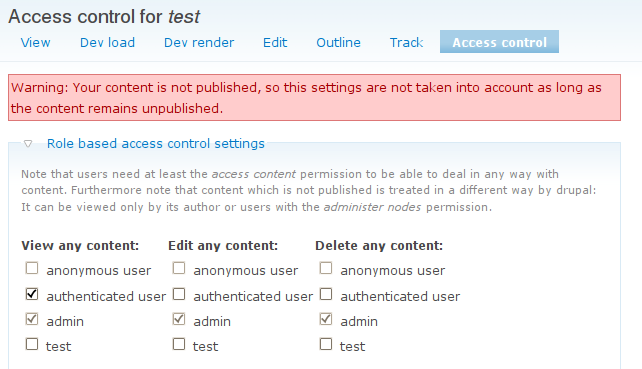 So once you have installed both modules you can create flags and use rules to add some behaviour to them, e.g. you can react once a flag is "flagged" or "unflagged" and send mail to the content node's author, unpublish it, change the content's access settings - or whatever you have actions and conditions for! Then the module also provides actions for flagging or unflagging flags, checking the flag count in case of global flags and even to "Trim flags", which allows you to restrict the number of flagged items. This way you could even create simple queues. Of course there also conditions to check whether a flag is flagged and again in case of a global flag you can check the flagging count. Amazing! Also the flag module comes with a bunch of useful settings, so you can configure the flag to have a confirmation form or to just work with an AJAX link. Together with the powerful rules integration one could implement a lot of useful stuff - want a custom link with custom permissions to publish a content node? Just use a flag and an appropriate rule! Read more about Flag module 6.x-1.0 shipping with rules integration! Bringing rules to the next level! While I've been working on the flag module's rules integration and getting the 1.0 release out, I've also fixed the details of my master thesis. I am happy to announce to further enhance rules during my thesis. The main feature I'm going to work on is allowing rules to work with remote sites and content. I'm going build client and server-side web service support, so that several drupal sites can talk to each other. Furthermore I'm going to make it possible to invoke arbitrary SOAP-based web-services out there, maybe also others. Perhaps the right way to do achieve that might be doing rules integration for the service module. You want to invoke a web-service? - Just use the action for it. You want to create a web-service? - Just build a rule set. Apart from that I'm going to build a readable rule export for documentation purposes, work out a basic publishing workflow and research some semantic web research capabilities. Actually I'm thinking about integrating with the RDF-API to get some meta-data about drupal objects, which is important to have in place when dealing with remote content steming from other drupal sites. Read more about Bringing rules to the next level! During the last days I was really busy with things like work and studying. So I had no time for the workflow-ng port "rules" for some days. Furthermore I'm going for one week to Ireland, so I won't have time during the next week either. Anyway I plan to get back working on it as soon as I'm back from Ireland. I've already ported the API and overhauled it. I've added support for rule sets and improved things, so that the API is ready for further enhancements like generic scheduling and d6 actions integration. Furthermore I've written simple tests for the API, which will be a great help during further development. As it looks like the rules API improvements take already too much time, so I won't be able to spend as much time as I'd like on the UI of the rules module. So I'll start with a more basic UI leaving the planned ajax/ahah usability improvements open for later. However if you like to help me working on that, contact me!